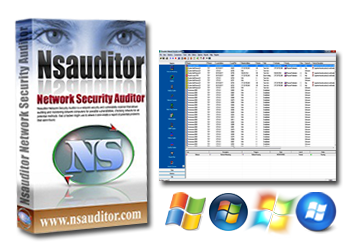 Nsauditor Network Security Auditor - Advanced All-In-One Network Security Auditing Tools Suite, includes more than 45 network tools and utilities for network security auditing, network scanning, network monitoring and more. NetBios Auditor is a tool to discover NetBios names. NetBios names are the names of the Services and Machines. NetBIOS Scanner is a powerful and fast tool for exploring networks , scanning a network within a given range of IP addresses and for listing computers which offer NetBIOS resource sharing service as well as their name tables and NetBIOS connections. Port Scanner is a fast TCP / UDP scanner, a tool that detects if certain TCP / UDP ports are open and accepts connections. TCP scanners are usually used to check if the remote computer runs services (e.g. Telnet or FTP). LM / NTLM Spider is a password audit and recovery tool. Passwords are sources of security vulnerabilities in different machines. This tool allows to identify and access password vulnerabilities. Ping is a tool that provides an opportunity to verify that the specified IP address exists. This tool is used to ensure that a host you are trying to reach is accessible. Ping also can be used with the reachable host to see how long it takes to get the response back. Also you can get information about the operating system of remote host. This tools shows the IP, TCP, UDP and ICMP statistics. Analyzing this statistics allows the detection of different kinds of network treatments as well as port scanning probes and network attacks. IP / ASN is a tool to determine which country an IP address or autonomous system number. This tool supports two ways of finding the country; searching by IP address or autonomous system number. Process Monitor is a tool to display the list of the processes currently running on computer and to show the program name, the unique process ID, the full path of program executable file, the name of the file manufacturer, and the name of modules and kernel objects used by the selected process.